To assess the effectiveness of the proposed automatic T2* curve fitting method for myocardial iron measurement. The measurement of cardiac iron is essential for preventing disease and managing iron-chelating treatment in thalassemia patients. A T2* technique has been developed and clinically validated for this purpose [1, 2]. However, this technique can be affected by noise, motion and blood artifacts. This is a particular problem for heavily iron loaded hearts where the very short T2* (< 10 ms) results in a rapid decay in myocardial signal intensity leading to a plateau for the low signal to noise ratio (SNR) in the later echo time images. By using a simple monoexponential model, the curve fitting is usually poor with T2* overestimated (Figure 1). In our previous work, we have used a truncation model where the late "plateau" points are subjectively discarded (Figure 1, red circles) and then the remaining signal is fitted with a mono exponential equation. Although different approaches have been proposed to understand this, we have shown [3, 4] that the truncation model produces more reproducible and accurate T2* measurements. 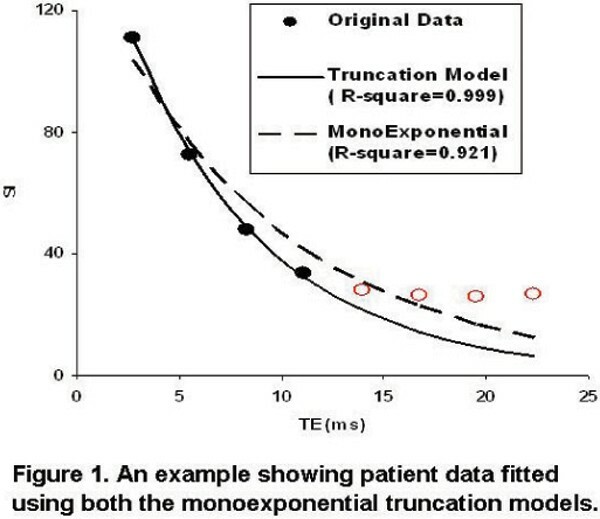 An example showing patient data fitted using both the monoexponential truncation models. For the truncation model the observer makes a decision on which points to discard and this has the potential to introduce a measurement error. In our experience, however, the decision is reasonably clear and the measurement difference between inclusion and exclusion of an uncertain point is also not large. However, to avoid this subjectivity we were motivated to develop an automatic procedure to enhance the clinical applications of the T2* technique. In total 255 thalassemia patients were scanned on a 1.5 T MRI scanner (Siemens Sonata) using the breath-hold T2* sequence . A single mid-ventricular short axis slice was imaged with T2* measured in the left ventricular septum. The study was approved by the local ethics committee and all patients gave informed consent. These rules were applied to all patient data analyses to produce non subjective measurements. The results were then compared with the T2* measurements conducted by three experienced clinical fellows. Figure 2 demonstrates the histogram of the discrepancy between the non subjective and subjective methods. Figure 3 shows the scatter plot of the comparison between these two methods. The coefficient of variation was 1.9% (n = 255). 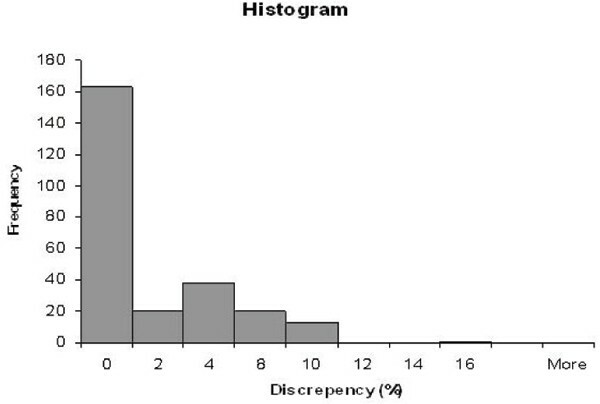 Histogram of the T2* discrepancies between the proposed and the subjective methods. Scatter plot with the line of identity, showing the comparison of the T2* measurements using the proposed and the subjective methods. 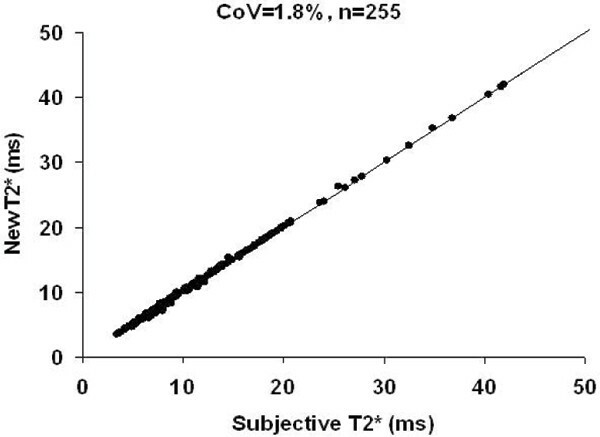 This study has demonstrated the good reproducibility of the proposed non subjective method for myocardial T2* curve fitting when using the truncation model. This approach simplifies the overall analysis and can be easily incorporated into T2* measurement software. This work was supported by NIH Grant: R01 DK66084-01. Research grant was also received from Novartis.